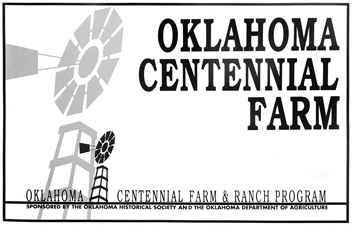 In 1989 the Oklahoma Historical Society and the Oklahoma Department of Agriculture established the Oklahoma Centennial Farm & Ranch Program to recognize those families who have continuously occupied their land and carried out farming or ranching operations for at least 100 years. Governor Henry Bellmon received the first application from H.C. Hitch Jr., owner of the Hitch Ranch. Since 1989 more than 1,600 families have received recognition through the program. Additionally, historic structures awards are given if four or more buildings or structures more than fifty years old remain on the land; this award helps identify historic buildings, structures, sites, districts, and objects associated with Oklahoma’s farming and ranching industries and has led to the listing of farms and ranches in the National Register of Historic Places. The Oklahoma Historical Society receives and reviews program applications throughout the year. Each qualifying family receives a special certificate and has the opportunity to purchase a metal sign for display on their farm or ranch. For further information, contact Shea Otley at 405-522-4485 or sjotley@okhistory.org. Our fees have changed: The application fee is now $25 and the sign fee is $75. Search and view the list of award recipients. Help us keep your property's records current by updating your contact information online. Share information about your family's history by completing this questionnaire. This questionnaire is optional and will have no effect on your acceptance into the program; however, we are interested in collecting as much information as possible about the lives of the farm and ranch families who have played such a vital role in Oklahoma’s development. Complete our property history questionnaire. We have initiated a project mapping the settlement patterns of our Oklahoma Centennial Farm & Ranch families. The goal of this project is to document the communities developed by groups of people as they settled across the state and to identify the histories associated with each. In commemoration of the 30th anniversary of the Oklahoma Centennial Farm & Ranch program, the Oklahoma Historical Society is sponsoring a new book celebrating our award-winning Centennial Farms & Ranches. We would like to feature your farm or ranch in this upcoming publication. This feature will include a historical profile of your farm or ranch and one photograph at no cost to you. Centennial Farm and Ranch owners will have the first opportunity to purchase this publication before it is offered to the public. Complete details about participating and preorders are available in our brochure (PDF). You may also visit Acclaim Press to preorder your copy online. The Oklahoma State University’s Oklahoma Oral History Research Program conducted more than seventy interviews with Oklahoma Centennial Farm & Ranch Program families. Visit the Centennial Farm Families Oral History Project to learn more and listen to interviews. Already a Recipient and Need a Sign? Shea Otley, State Historic Preservation Office, 800 Nazih Zuhdi Drive, Oklahoma City, OK 73105. Please include the name and county of your property, along with an address to which the sign can be shipped (PO boxes are not acceptable). NOTE: This is only for current Oklahoma Centennial Farm & Ranch Program recipients. If you are not a recipient, please choose the application above and apply to see if you are eligible.